Music spontaneity will, after all, be allowed during the Nadur carnival celebrations as police are no longer insisting that performing rock bands submit their planned repertoire for vetting. In a statement issued yesterday the police said they had "reconsidered the decision" but did not explain what exactly led to this change of strategy. "The reason why the police asked for the names of the bands and the songs they'd play was a genuine one. This was so that police could gauge the size of the crowd attending the (carnival) activity to make logistical arrangements," the police said. The statement was issued in reaction to a story published in The Sunday Times in which a concerned band member said the Nadur local council and police were requesting to vet lyrics before the event in an attempt to eliminate offensive or vulgar language. The police denied ever asking for the lyrics and said the original decision, to see the song repertoire, was taken with the cooperation of Nadur mayor Miriam Portelli. Ms Portelli had explained it was the police who had suggested vetting lyrics but she did not know why. Police sources had told The Sunday Times that the police wanted to vet the lyrics of songs, other than those that were well-known, in order to stamp out vulgar and offensive language or language that could make people upset or start a fight. After releasing yesterday's statement, the police were asked to clarify how the list of songs could help them make logistical decisions and why they had changed strategy. In reply the police wrote: "After considering its request to obtain the song titles, it (the police) decided this information is no longer relevant for the upkeep of public order and peace. For this reason, the original decision was withdrawn." In a statement yesterday evening, the Nadur council said the local council had not requested the lyrics of songs. Further to a police request, it said, owners of establishments were requested to provide details of the bands to be performing during the activity together with names of the songs they would perform. The council added that three permits had been issued for the stages, which were to be provided by the council. The council also urged those attending the spontaneous carnival to respect public order and decency. 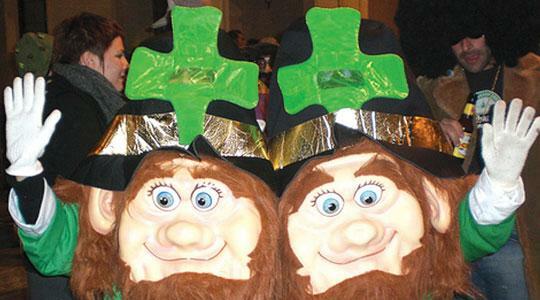 The Nadur carnival, which kicks off on Friday, has established a reputation for spontaneity. The celebrations traditionally attract thousands of people to Gozo for the five-day festivities, creating a series of management problems. Last year, controversy arose when some revellers dressed up as Jesus Christ and as nuns. Amid condemnation from the bishops, the revellers ended up in court for choosing costumes deemed to be illegal and offensive to the Roman Catholic religion. One young man was given a one-month suspended jail term for dressing up as Jesus. This was deemed as excessive censorship by some who argued it threatened the spontaneous character of the Nadur carnival. In reaction to this, last year, a group was set up on Facebook with a page entitled Friends of Jesus: Nadur 2010 which said it was organising a "peaceful protest against a modern-day inquisition". The group said it hoped to encourage hundreds of people to dress up as Jesus in an attempt to overwhelm any fear of retribution "by numbers". Last week the mayor explained that police presence would this year be stepped up to ensure public morals were respected, traffic was well managed and glass bottles were banned from the streets.